Republicans will begin hammering out the details of the new party platform today with issues directly affecting our state at the forefront. States rights, Sage grouse, energy production on public lands and who controls those public lands are all expected to be addressed, state GOP Chairman Steve House tells the Daily Sentinel. The GOP platform will call on Congress to eliminate strangling mandates on federal grants, because state’s rights. Republicans will call for the construction of export pipelines like Keystone, and natural gas terminals that would be a significant boost to Colorado’s energy economy and thousands of jobs here. 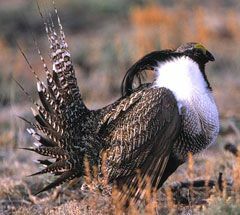 We’re particularly excited about platform language that tells the government to block the sage grouse and prairie chicken from the Endangered Species List. What that platform plank needs to address is well, is the growing popularity in Washington to create overly restrictive land-use plans for certain species not even listed, just to block energy development and ranching. We’re also eager to see the final language that would take federal lands where energy development is being blocked, and turn it over to the state, or possibly sell off that land from the vast national inventory into private hands. We expect the national media will be focused on twisting the party’s intentions in the platform on social issues, completely ignoring western needs. And when they do, all we will hear is Ted Bundy and crazy ranchers. So stay tuned here, PeakNation™, as we endeavor to cut through the bunk and bring you the real details as they develop.